The biggest issue on the November ballot is the proposed state constitutional amendment for public school funding. With competing alternatives on the ballot, Initiative 42 and Initiative 42A, voters will make two choices: whether to amend the state constitution at all and, if approved, whether to amend with the language of Initiative 42 or Initiative 42A. Gov. Phil Bryant on Wednesday approved the ballot for the Nov. 3 general election, including two dueling constitutional amendments on school funding. Voters will have to pay attention to their ballots in November – it gets a little tricky around the education funding initiatives. 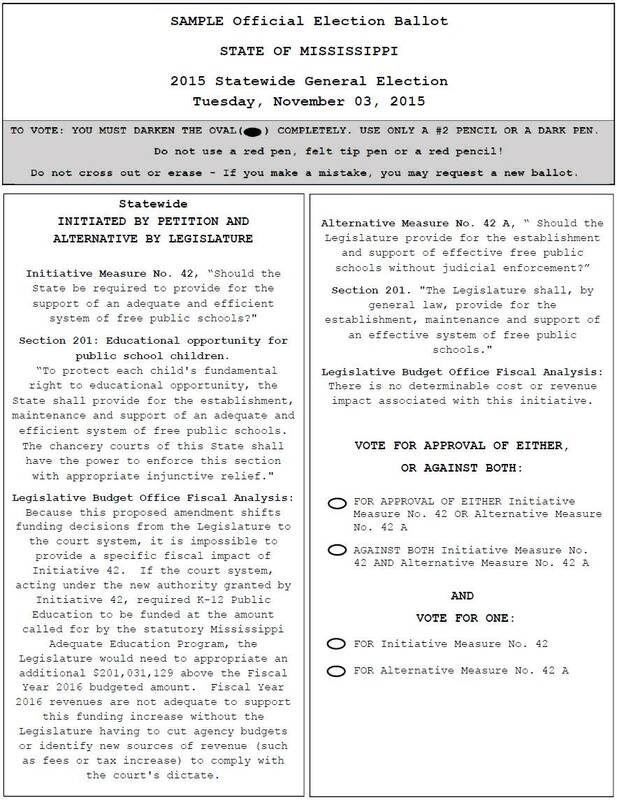 The Initiative 42 Ballot Title asks, “Should the State be required to provide for the support of an adequate and efficient system of free public schools?” But hidden in the ballot summary which will not be on the ballot, Initiative 42 establishes public education as a fundamental right and grants authority to the chancery courts to determine and enforce adequate funding. Currently, the state legislature determines how much to fund public schools along with other budget priorities. If the bill passed by the House and Senate is signed by Gov. Phil Bryant, Mississippi public education will receive a record $2.52 billion in 2016. Over 4 years, education funding will increase by $285 million. On February 18th with virtually no debate, the House unanimously passed a bill to increase the Mississippi Adequate Education Program by $109.9 million. Since both chambers’ priorities were very similar, the Senate simply passed House Bill 1536 on March 17th with a 49-2 vote. Those promoting Initiative 42, a proposed constitution amendment to require fully funding the MAEP formula, remain unsatisfied despite the record amount.